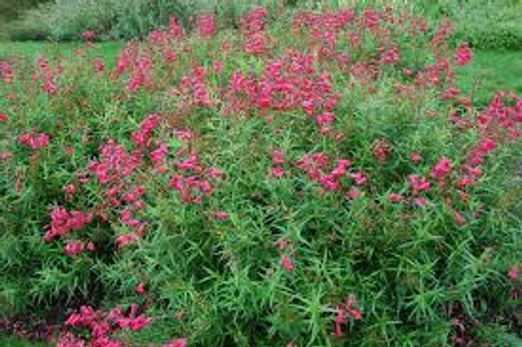 ABOUT THIS PLANT: Penstemon is a western United States native that has colorful tubular flowers on tall spikes. 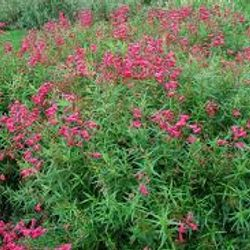 This prairie plant thrives in hot, sunny conditions and is a stunning addition to wildflower plantings. Another common name is beardtongue.Penstemon forms dense spikes of tubular flowers in early to mid summer. Flower colors include pink, blue, red, purple, and white. The plants grow 1' to 3' tall, depending on the variety, and look best planted in groups. Smaller varieties are good for rock gardens and the front of the border, while taller types are best in the wildflower plantings or in the back of the border. Penstemon is an easy care, low maintenance plant, great for cut flower and attracts hummingbirds.Tolerates dry soil. is level with the soil surface. Carefully fill in around the root ball and firm the soil gently. Water thoroughly. CARE:Apply a thin layer of compost each spring, followed by a 2-inch layer of mulch to retain moisture and control weeds. Water plants during the summer if rainfall is less than 1 inch per week. After the first killing frost, cut stems back to an inch or two above soil line. 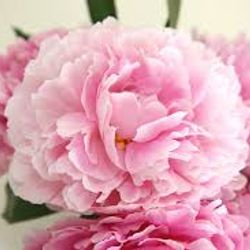 ABOUT THIS PLANT:Peonies are renowned for their large, colorful, bowl-shaped, flowers and dark green foliage. Once established, these beauties are some of the longest-lived and most reliable garden plants.Peony varieties with huge, double flowers will be the focal point of the garden when they bloom in early summer. Single-flowered types are more subtle and combine well with other perennials. Flower colors include pink, red, white, and yellow, and the plants grow 18 inches to 3 feet tall, depending on the variety. Peonies make an attractive low hedge. However, they can take up to 3 years to mature, and don't perform well in hot summer climates. two inches below the soil surface. If you plant them deeper, they may fail to bloom. CARE:Apply a thin layer of compost each spring, followed by a 2-inch layer of mulch to retain moisture and control weeds. Water plants during the summer if rainfall is less than 1 inch per week. Stake tall varieties to keep them upright. After the first killing frost, cut stems back to an inch or two above soil line. The first winter, apply a 4- to 6-inch layer of protective mulch after the ground freezes, to prevent roots from being heaved out of the ground by alternate freezing and thawing. Once your peonies are established, annual winter mulching is not necessary. Remove this protective mulch in the spring. ABOUT THIS PLANT:Sporting huge, cup-shaped blooms in early summer, the Oriental poppy is the most striking of the perennial poppies, and the delicate, papery flowers belie the plant's hardiness and durability.A favorite subject for artists, Oriental poppy flowers are the focal point in the garden when they are in full bloom in late spring to early summer. The plant's huge flowers may be up to 6 inches across on stems up to 4 feet tall. Colors include red, salmon, orange, crimson, and white. 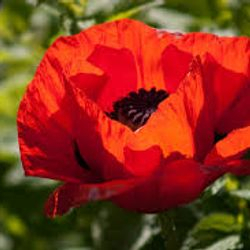 Oriental poppies perform poorly in regions with hot summers, and the flowers may need staking to keep from flopping over when in full bloom. The plants go dormant after blooming.Poppies are easy care, low maintenance and deer resistant. PLANTING TIPS:Plant in spring, spacing plants 2 to 3 feet apart, depending on the variety. Prepare the garden bed by using a garden fork or tiller to loosen the soil to a depth of 12 to 15 inches, then mix in a 2- to 4-inch layer of compost. Dig a hole twice the diameter of the pot the plant is in. Carefully remove the plant from its container and place it in the hole so the top of the root ball is level with the soil surface. Carefully fill in around the root ball and firm the soil gently. Water thoroughly. CARE:Apply a thin layer of compost each spring, followed by a 2-inch layer of mulch to retain moisture and control weeds. During the summer months, when plants are dormant, watering is needed only during periods of drought. In autumn, poppies will resume foliage growth until frost, and these green leaves will remain over winter. After soil has frozen, apply a 4- to 6-inch layer of protective mulch to prevent heaving during periods of temperature fluctuation. When the weather warms up in spring, gradually remove the winter mulch. Plants can be divided in early spring or summer. 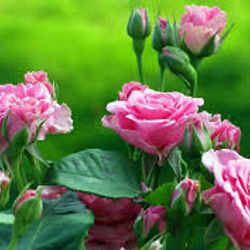 ABOUT THIS PLANT:Roses come in a huge range of sizes, shapes, and flower colors. A hugely popular plant, the rose is also our national floral emblem.There is a rose for every garden situation and need, from climbers to adorn a trellis, to miniatures for containers, to long-stemmed types for bouquets. Because of this variety, it's important to choose carefully. If you are looking for the familiar rose bush, consider hybrid teas, floribundas, or shrub roses. Hybrid teas are tall, long-stemmed roses ideal for cutting. Floribundas are shorter and bloom more freely, setting clusters of blossoms rather than a single bloom on a stem. Both these require regular maintenance for optimum performance. Shrub roses (sometimes called landscape roses), on the other hand, require somewhat less attention, adapt more readily to a wider range of conditions, and offer more disease resistance. PLANTING TIPS:Select a site with full sun and well-drained soil.Plant in early spring or fall, depending on your location. Space plants 2 to 3 feet apart, depending on the variety. half full with soil and water it well to settle the soil and eliminate air pockets. Let the water drain, then fill the remainder of hole with soil and water thoroughly. CARE:Apply a layer of compost under the shrub each spring, followed by a 2-inch layer of mulch to retain moisture and control weeds, keeping mulch a few inches away from the stems. Water plants during the summer if rainfall is less than 1 inch per week. Pruning techniques vary with the type of rose.